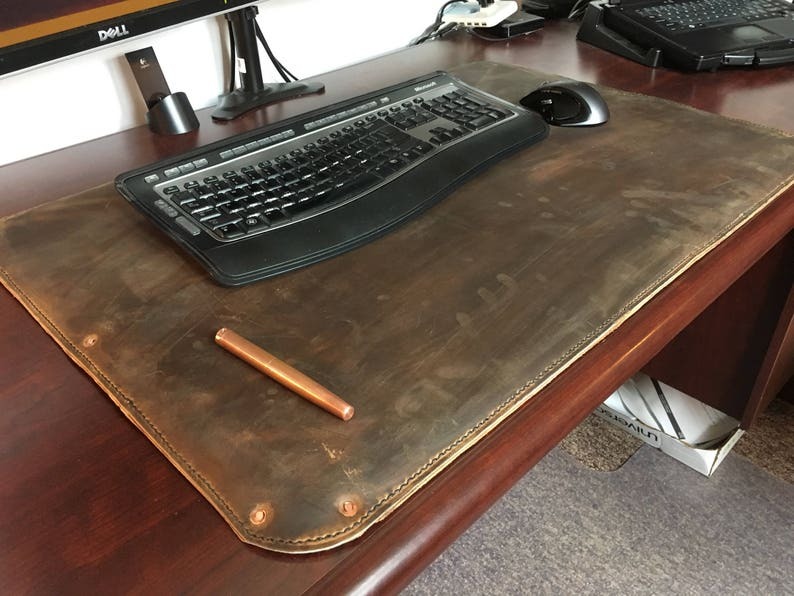 Large Full grain leather desk pad/desk cover/blotter/desk mat. Large size 32" x 22"
The joys of working in an office come with multiple sensory experiences: fluorescent lighting, computer screens, and someone cooking fish in the community microwave. Improve your office and create your own sensory experiences with a full grain leather desk pad. Made out of 100% full grain leather these desk pads are made entirely by hand and feature a thin neoprene lining and plush suede backing. They are completely hand stitched and feature hand peened copper rivets. 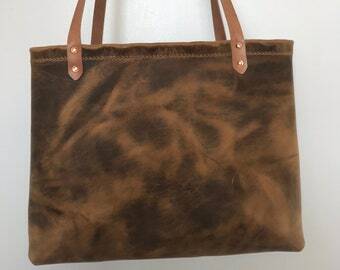 This custom product can be made with your choice of leather, suede, and thread colors. Large is 32" x 22"
All products including leather, thread, and even the rivets are made here in the USA and the deskpad is fully cut by hand, assembled by hand, and stitched by hand by me in Vermont. IMPORTANT FOR ORDERING: In order to pick thread and suede colors just drop me a note when you order. Otherwise, brown or black colors will be used. Small Full grain leather desk pad/desk cover/blotter/desk mat. Small size 24" x 18"
Lined full grain leather valet tray organizer. Richard is a true craftsmen this desk pad is worth every penny don't think twice. This is a top notch craft desk pad. One has to wait (everything is handmade from scratch -- cut, stitched, and riveted), but the pad looks great and will last forever. If you want to buy a deskpad that will last you the rest of your life (and beyond), buy one of these. 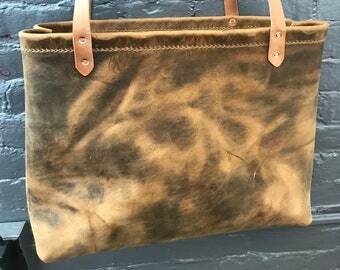 Great craftmanship, beautiful leather and looked exactly as pictured. Well worth the expense! Full grain leather apron/shop apron/grilling apron/cookout all leather. Women's handmade leather purse, handbag, full grain leather. 12"x8"x2"